...And Mary is dreaming of one more young woman to add to the stable of disciples who have forsaken their own mothers and turned to follow Mary Worth: Toby, Dawn, Gina, Vera, Adrian, Lynn, Delilah, Liza, etc., etc. Of all the varied landscapes in Santa Royale, Dead Jogger's Curve is perhaps the most perilous. Panel 1: Chin Napkin slowly rises to take his rightful place on the chin of Beth Kinley. Oh my word. I thought for today's post it might be fun to post a few ridiculous quotes from Romance Novels just so we could see what Mary was talking about. So I did a Google search, and I have never read anything so obscene (and ridiculous) in my life! I think I'm going to have to side with Mother Kinley on this one. I feel so trashy. The thought of Mary Worth reading this stuff makes me vomit a little bit inside. "I wish I'd never met your father! I wish you'd never been born." Mary's mascara is a little trashy, don't you think? Just like in those romance novels she's reading all the time. "Attention. Here's an update on tonight's dinner. It was veal. I repeat, veal. The winner of tonight's mystery meat contest is Jeffrey Corbin who guessed 'some kind of beef.'" 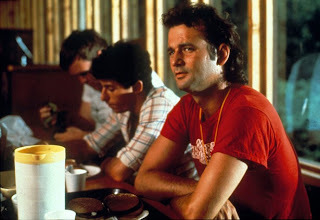 ~~ Bill Murray in Meatballs. I've been reading Washington: A Life -- the Pulitzer Prize winning biography of George Washington. You know who also had an harsh mother? George Washington. And look what he accomplished. So, don't give up on Beth, yet, Tom. One day she might become First Lady. I'm wondering why Elinor bothers to whisper this? I really wish she'd just say it to Mary directly. Regular water... and true love if it ever comes knocking at the door. I love asparagus, almost as much as I'm lovin' Mama Kinley! Wha...? 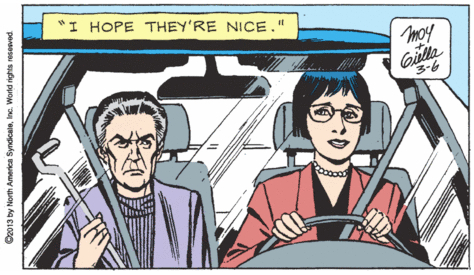 Did Mama Kinley punch Mary Worth in the eye? That is harsh. Well, Toby's out. I wish we could have seen her scary encounter with Mother Kinley: "Welcome to Charterstone. You'll find it's really friendly here. Can I find someone to wash your windows for you? Have you had dinner with Mary yet?" "Go on, go tell her she'll not be appeasing her ugly appetite with ME... Blondie! Or do I have to tell her because you don't have the guts! Huh, Blondie? You have the guts, Blondie?" "Thanks, Mary, for all your hard work finding Mr. Allora to carry our luggage upstairs. We couldn't have done it without you, Mary." Citizens of Santa Royale: If you haven't had an opportunity to read this exciting adventure posted by faithful reader J.R. Clark, please click here. With all that gray luggage and her pointy finger, Elinor is going to fit in at Charterstone just fine. Ever since Mary used up her One Good Deed for the Year, she's totally useless. It looks like Tom Harpman's new love is moving in just down the hall! Perhaps he will inspire her to walk without her cane. Good ol' Toby. So adept at digging down to the roots of the real issue. Based on the starch in his bathrobe cuffs, and the shine on his counter tops (panel 1), I'm guessing Tom Harpman is a neat freak. Of course, a neat freak wouldn't leave his giant kitchen broom sitting out when company arrives. 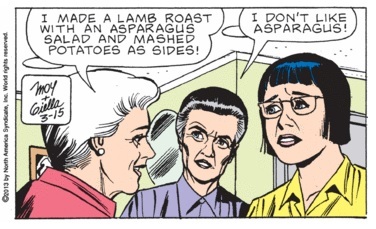 Mary Worth is an antibiotic.